I was recently on vacation, in Lyon and Burgundy, a food-and-wine vacation, of little literary interest. Well, try the Memoirs of Phillippe de Commines for some firsthand Burgundy history. The Duchy, not the wine, I mean. Aside from that, we ended up, briefly, in Geneva, where we visited the birthplace of Jean-Jacques Rousseau, the upstairs of which is now, how to describe it, a narrated, illustrated encyclopedia entry. How fun does that sound. Not worth visiting except as a pilgrimage, and an excuse to think about this complex, and, to me, confusing figure. So, put that way, worth visiting, absolutely. 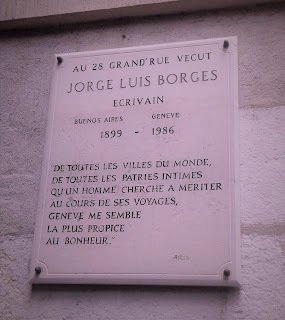 Geneva has no place at all in my idea of Borges, but my idea is wrong. He went to John Calvin High School, for pity’s sake. That is a true Genevan credential.